Each month, millions of visitors (literally) come to About.com with questions about barbecuing and grilling. And each month, a lanky blond man with a penchant for wearing black answers those questions: Derrick Riches from Salt Lake City. Riches grew up hunting, fishing, and camp cooking in mountains of the western U.S., and caught barbecue fever during a summer in central Texas. He has grilled over everything from a hole in the ground to a $20,000 stainless steel gas super grill, and has been quoted by media outlets from the Wall Street Journal to the BBC. 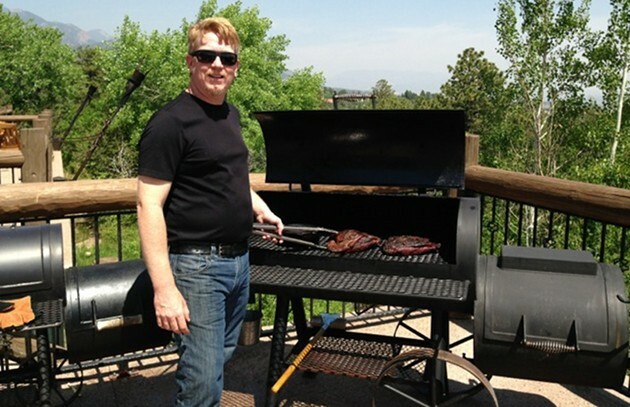 Of his current position with About.com (held since 1997), he says: “My goal is to help you make the most of your first experience with barbecue and grilling, whether you’re buying a grill, cooking a steak, or smoking a brisket. I believe that barbecue, regardless of the definition, brings people together and that with a little help, anyone can be a great backyard gourmet.” Amen. What are the three most frequently asked questions? First and foremost about purchasing a grill. There are a lot of products out there and many people are confused about exactly what it is they are looking for. This is particularly problematic for those with little grilling experience. They want a grill that will serve them well, but just aren’t sure about how they are expected to use it. The second most frequently asked question comes after an unsuccessful cookout. Burnt chicken, disintegrated fish, or other cooking mistakes send people looking for answers about what went wrong. Typically, the answer is to use the correct temperature for the food they are cooking. The third most common type of question is related to smoking and true barbecue. The Internet has introduced classic barbecue to many people who don’t know where to start. I always try to provide basic information to help them get started. I believe that a good first experience encourages many to continue cooking outdoors. What’s the weirdest question you’ve ever been asked? It came from an Indonesian, who wanted to know how to prepare hamburgers for visiting Americans. Walking him through the process of burger making wasn’t as easy as it sounds, since there were very few common concepts. I had to breakdown a hamburger to extremely basic elements. Have you ever been stumped? Of course. One of the best parts of doing this is that with a global readership, I am constantly learning about different cooking methods, various names of the same ingredient, and how to describe methods in the most basic of terms. How have the questions changed over the last five years and what does that say about the evolution of American barbecuing and grilling? When I first started writing about barbecue, people were mystified by the idea of rubs. We’ve become much more knowledgeable over the years and this has led many to much more sophisticated levels of cooking. I also believe that as the Internet has matured most of the simple questions have been answered. What trends in barbecuing and grilling are happening now based on kinds of questions people are sending you? Smoke has become a flavor and not simply a method of cooking. I find an increasing number of people are looking for methods for infusing smoke flavor into foods that have traditionally existed outside the world of barbecue and grilling. Also, many people seem to be moving away from the traditional gas grill. With an explosion of infrared and pellet grills on the market, people are seeking new ways of grilling and smoking. What percentage of the questions come from men? From women? Most of the questions I receive still come from men, but I am hearing more and more from women. This reflects the fact that many women are grilling and have even taken to smoking. I foresee that in a few years it might reach a 50/50 ratio. What sort of grill(s) do you own? My grills come and go all the time. At the moment I have 13, including gas, charcoal, and portable grills. Lately, my go-to grill has been a Weber 22.5 charcoal grill. This is one of the most common grills in the world and I like to use products that most of my readers use. I also regularly use a Weber Smokey Mountain, a Big Green Egg, a Saber Infrared Gas Grill, and a Good One Open Range Smoker. What are your three go-to dishes at home? What are the three most common mistakes people seem to make at the grill? First: using the wrong heat for the food they are cooking. This is particularly a problem with gas grills where many people think the higher the temperature, the better. Second: not understanding their grill. Many people presume that the modern grill isn’t much more complicated than their oven. A good grill offers a lot more versatility in cooking and it is important to explore its full potential. Third: lack of planning. 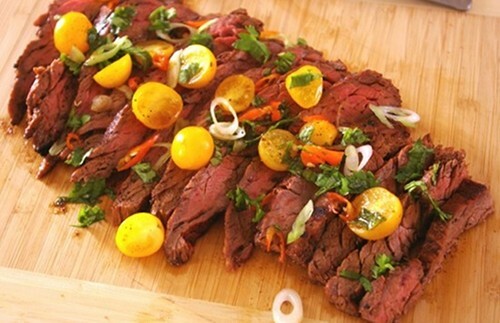 Many people will fire up their grill for a large gathering without planning ahead. Any big meal requires planning, and a great barbecue should have a great plan. Think ahead and there will be more time to enjoy the gathering and less time running around. Three pieces of advice for taking your grilling to the next level? Barbecue and grilling should be fun. Some outdoor cooks become quite rigid in their beliefs on what is or isn’t “barbecue” and how certain foods should be grilled. When cooking becomes tedious, it is time to get back to basics. If the cookout becomes a chore, you are doing it wrong. Try new things. The modern grill is a reflection of the origin of cooking. It is the one universal cooking method and the possibilities are endless. So grill more than burgers and chops and don’t be afraid to try new things. Take good care of your grill or smoker. These pieces of cooking equipment are so much more than a microwave oven. Knowing your grill and how best to use it is an art form that takes time to develop. Appreciate the grill and it will serve you well. Sign up and get a free ebook of Raichlen’s Burgers plus weekly recipes and tips straight from Steven Raichlen! BarbecueBible.com receives commissions made through links to Amazon and other vendors through the blog and store pages.